Summer is a time for things to slow down. Every year since I was a kid (probably 9 years old), I’ve had a summer reading list. 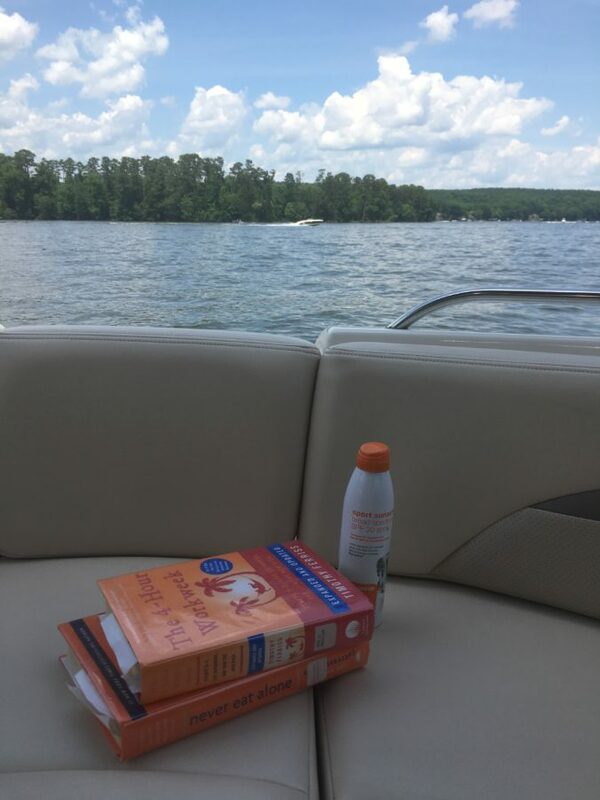 Whether it was a challenge at the local library or one assigned for school, I love to read through a list of books at the pool or on the boat. Many of these books are books I’ve wanted to read for awhile but now I’m making it happen! It may be heavy reading for some weekend getaways, but this is what I’ve been focusing on this first quarter and need some inspiration for new ideas. I’ve already finished two and liked them so much I bought them (I usually check out books at the library). The rest will help me research and prepare for future wanderings. Author Tim Ferriss updated this book in 2009, and the only reason I had to put it down is to have time to process his ideas. I don’t agree with everything he says but love the concept. My main disagreement is believing one can be an effective and inspirational leader at their company without being present, but other than that, he has great suggestions for improving efficiencies so you can spend time doing other things. I originally rented this book from the library but bought it because it actually makes for a good guide. If you want to do more by having more time – make sure to check out this book! I’m an introvert and do not feel comfortable in large social situations. This book has been recommended to me at a dozen of training sessions, and after reading it, I understand why! Keith Ferrazzi is a master networker and has documented many of his practices he has used to help leverage his career forward. I also bought this one since it is a good guide with actionable steps. I would recommend this book to anyone – regardless of whether you’re an introvert or extrovert. This is my third time reading Steven Covey’s classic, and I believe there is a reason why it has been reprinted so many times. If you haven’t read this book, you must do so. I get new ideas each time I read it and find it very motivational. This is on my list since it is recommended in many money blogs and from financial experts. Essentially, Thomas Stanley studied the behaviors of millionaires to determine what these individuals have in common – and the traits are more common than what would be expected! Since I am working to financial independence so I can travel more, this is on the top of my list. I love history and have been reading biographies of US presidents. I started with George Washington at the end of 2013, and am about to finish my audiobook on Eisenhower. Jean Edward Smith has carefully documented Eisenhower’s career through the army, WWII, and his presidency. I believe Eisenhower is one of the best leaders our country has had and learning the details of his life bring it to color. I visited his birthplace in Abilene, KS, and it is a great example of the American dream. A farm boy from a relatively poor family can work hard and become the leader of the Allied forces and President of the United States. One of my running friends recommended this as motivation. Christopher McDougall researches a tribe in Africa and inspires anyone who wants to run. Don’t know much of the details, but I am looking forward to the motivation. My next big travel adventure is to hike to Machu Picchu. I enjoy reading and researching so before big adventures, I need to research. Mark Adams, the author, was interviewed on one of my favorite podcasts, Travel with Rick Steves. This is his adventure in re-creating the original discovery of Machu Picchu. Well, that makes for my summer! What about you? I love cheesy beach reads if anyone has suggestions.